So What Do Your Parents Do? There have been a few times recently that I have asked one of my peers what their parents do. A question that is very standard that I would expect most people to know the answer to. My peers have proceeded to tell me that they aren’t really sure what their parents do or even what their job title is. I am shocked by this because growing up on a ranch, I know exactly what my parents do because I am doing it right alongside of them. Meet the 2016-2017 Class of The Crew! Nebraska Farm Bureau has identified ten social media savvy student members to join our Crew. The Crew is a group of Nebraska Farm Bureau student members who enjoy agriculture communication and social media. Together, The Crew will work on reaching a larger audience with pro-ag messages and will help put a face to agriculture through social media in conjunction with Nebraska Farm Bureau. Members of The Crew have access to unique training sessions, such as exploring social media strategies on Capitol Hill. NFBF is excited to introduce our Crew members to you! For the next year these students will help promote agriculture and rural America through their work on social media! Hello! My name is Abby Steffen, unlike many of my Crew-mates, I did not grow up on a farm. However, I did grow up in the rural town of Crofton, Nebraska. I have been exposed to many aspects of agriculture since I was a little girl; my grandparents owned a small farm not too far away with a variety of livestock and crops. I spent many summer days watching my grandpa work and sometimes I even got to help. As I moved into high school I became very involved in my town’s local FFA chapter. Junior year, I was appointed chapter Reporter and the following year I was voted as President. It was my early childhood experiences and my involvement in FFA that sparked my interest and passion for communication agriculture. Now, as a sophomore at the University of Nebraska-Lincoln, I am majoring in Agricultural and Environmental Sciences Communication. I am also active in the Ag Sack Lunch Program, a UCARE research project, and student organizations such as the Agricultural Communicators of Tomorrow and Collegiate Farm Bureau. I am looking forward to the potential adventures that will come my way! “Yeah I live on a farm!” That’s what I would say when my friends from high school, in populated Omaha, Nebraska, asked. I was under the impression that I lived on a nice size farm and was contributing majorly to the agricultural industry. Then I came to the University of Nebraska-Lincoln and met people who lived on farms a hundred times larger than mine. I was discouraged, but soon realized I was contributing in my own way. My name is Catherine Jones and I am from a small farm in Omaha Nebraska, but I am making a big difference when it comes to the future of agriculture. My 48-acre farm was just big enough to raise livestock for urban youth to exhibit in 4-H. They got to experience how to raise livestock and how agriculture contributes to their daily lives, all while living in the metro. This is where I realized the disconnect between the population and our state’s agricultural industry. I made the decision to come to UNL and study Agricultural Environmental Sciences Communication and minor in Animal Science and Ag Business. Living in the city on a farm I got to see both worlds and the misunderstandings upfront, this gave me the passion to be an advocate for agriculture! My name is Corin Pelster, I am from Elgin, Nebraska and have had a passion for agriculture my whole life. Growing up on my family’s ranch I got to experience first-hand the hard work that is put into agriculture. I was extremely active in my schools FFA chapter throughout high school where I gained a significant knowledge of how important the agriculture industry really is. It wasn’t until my last semester of senior year, though, that I decided I wanted to pursue a career in agriculture for myself, and it has been one of the best decisions I have ever made. I am currently a junior Agribusiness major with a Banking and Finance option at the University of Nebraska-Lincoln with intent to graduate December 2017. I have always enjoyed talking about agriculture with others and knew this would be a wonderful opportunity to advocate for agriculture! My name is Courtney Nelson. I live on a farm in east central Nebraska where we grow corn, soybeans, and alfalfa. We also own a family farm in Kansas where we grow wheat and milo. As part of my SAE, I rent 40 acres of land on which I grew corn this year, and I also own market swine. I am a senior in high school, and I am very involved in a variety of activities. My hobbies include watching Nebraska volleyball and playing the piano. I have always been surrounded by agriculture, but I didn’t realize my passion for it until I attended the Nebraska Agricultural Youth Institute this past summer. I look forward to sharing my story and passion about agriculture and learning more about the industry as well. Hello advocates for agriculture! My name is Darby O’Connor from Paxton, Nebraska. I pride myself in the fact that I am a part of the agriculture industry. My part in agriculture is expressed through my hobby of showing livestock – I enjoy spending time in the barn preparing for shows. I am active in FFA where I serve as the Paxton FFA President, and continue to grow as an agriculturalist. I am proud to play a role in such an amazing industry and love sharing my passion for agriculture with both producers and consumers. I grew up on a ranch north of Paxton and love the experiences that came with growing up in an agricultural family. My mother is my inspiration when loving to show, my father who was a rancher is the reason I was blessed enough to grow up where I did, my brother Merritt continues to follow his passion of livestock while judging at SDSU and my other brother Rhett in McCook for rodeo. I love to share the greatness of agriculture and can’t wait for the journey that The Crew will send me on. My name is Kelli Mashino and I live on a family farm near the small town of Spencer, NE. I’m a third generation agriculturalist with strong roots in faith, family, farming, and FFA. I’m a senior in high school and plan to attend the University of Nebraska-Lincoln for Agricultural Communications next fall. I am very active in extracurriculars at my school. FFA, however, is my favorite. I have such a HUGE passion for agriculture. Growing up on the farm, I have learned the true value of hard work and dedication. My appreciation for agriculture has grown more and more the older I get and I have found that advocating for agriculture is one of my biggest passions! I love public speaking as well as writing. Writing and giving speeches have always been strengths of mine in high school. That is why I am so excited to be joining the CREW! I can’t wait to put my strengths to work and help spread the word of agriculture. Agricultural literacy is far more important than most people think. That’s why everyone who has a background in agriculture should take a stand and share their story. I can’t wait to go on this journey with you all! It’s going to be a great year of advocating for ag! I am Maisie Kennicutt! I am 17 years old and a senior in high school from Wallace, Nebraska! For those of you who have never heard of such a place, it is a small town of maybe 300 people or less. It is located in the southwestern corner of the state. I live on a little farm about 18 miles southwest of town where I raise sheep, hogs and chickens. I have a brother, Aidan, and a sister, Emily, and we have been involved in sheep 4-H for 3 years now. We had never done any type for 4-H before but we decided to give it a try and we fell in love with it! Now we have a few ewes we saved back this year because we would like to start our own herd. Other than working with our sheep, I spend most of my time at school activities. I enjoy going to the different sporting events at our school and cheering loud for all my friends. Most of the time I am in the ag room working on projects or getting study packets ready for competitions. I spend any time I possibly can outside. Whether I am doing animal chores or just working on little things around the farm. My goal for my future is to attend the University of Nebraska-Lincoln and get my degree in agriculture education. With my degree, I want to return to a small Nebraska town to teach the generations after me about an industry that is so important in all of our lives. I am an aspiring horticulturist, landscape designer, and drone flyer. My name is Sam Steward. I am in my second year at Southeast Community College in Beatrice, Nebraska. My major is Agriculture Business and Management Technology. I have two focuses in Horticulture and Agribusiness. I will be receiving my Precision Agriculture Certificate in September. I am very involved at SCC. I am president of SCC Ag Club, Vice President of SCC Collegiate Farm Bureau, and I am currently in the process of getting Horticulture Club started back up on campus. I am originally from Hickman, Nebraska, but I recently moved to Mead, Nebraska. I graduated from Norris High School where I was very involved in my FFA chapter. I was also a part of the Star City Llama and Alpaca 4-H club where I showed my llamas and alpacas at the Lancaster County Fair. I have been a member of the Alpaca and Llama Show Association for 15 years. I am also member of the Nebraska Arborist Association and the Nebraska Nursery and Landscape Association. I am also attending classes to become a certified Arborist for the state of Nebraska. My name is Savannah Schafer and I am excited to be a CREW member! I am a sophomore majoring in Ag Education with a minor in Animal Science at the University of Nebraska-Lincoln. My parents and I operate the Schafer Angus Farm near Nehawka, Nebraska. Our farm is small but mighty with a herd of registered Angus cows that provide high-quality replacement heifers, bulls, and market animals. We raise corn, soybeans, and alfalfa hay. My passion for the agriculture industry has developed as I have grown. I was an active member in 4-H and am still an involved member in FFA. FFA provided me countless opportunities to become an advocate for agriculture by experiencing the world of agriculture up close and personal through contests, conventions, and classes. I am excited to receive my American Degree in October. My membership in the Nebraska Junior Angus Association opened numerous channels to the cattle industry and today’s issues. Through these programs, I have developed wonderful friendships with people who share my enthusiasm and concerns. I enjoy discussing today’s issues with other enthusiasts and hope to make a difference in closing the gap between farmer/rancher and the consumer. I am the fourth generation to help run the family farm and I hope to keep it running for future generations to come. My goal is help educate all ages as to the importance of agriculture, farmers, and ranchers. I am dedicated to talking about the issues with anyone and everyone! Hello! 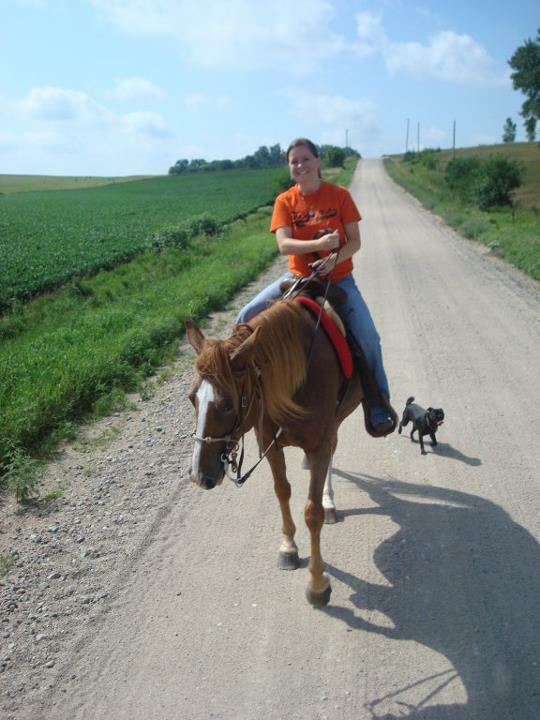 I am Katie Nolles, a fifth generation Hereford breeder on both sides of my family, from Bassett, Nebraska. Growing up on my family’s ranch was the most influential part of my life, as it shaped my work ethic, developed my passion for agriculture, and instilled my values in me. For as long as I can remember, I have looked forward to working cattle, branding, checking calves, feeding hay, fixing fence, and making breeding decisions. Our operation is diverse; we raise registered Hereford cattle to sell bulls to cattlemen, have a custom embryo placement business, and a small herd of commercial cows to raise F1 calves. My parents met while showing cattle, so it is natural that I follow in their footsteps by showing my Herefords on a local, state, and national level. Maintaining partnerships and friendships with people across the country that span multiple generations is special to me. Showing livestock led me to a few key youth leadership organizations. Joining 4-H as a five-year-old, I quickly took advantage of the many projects and learning experiences. FFA honed my public speaking skills, broadened my passion for agriculture, allowed me to travel the world, and opened my eyes to my future career in agricultural education. The Nebraska and National Junior Hereford Associations established my career in the beef industry. All of these organizations gave me leadership and career skills, along with lifelong friendships. As I transition out of these organizations, I look back with fond memories at serving as a FFA State Officer, National Hereford Queen, and National 4-H Congress Youth Leadership Team member. Currently, I am a sophomore at UNL majoring in Agricultural Education. I’m passionate about learning as much as possible about agriculture. My experience and interests range from production to policy to education and outreach. I’m looking forward to connecting with you this year as a member of Nebraska Farm Bureau’s CREW! As a new contributor to this blog, I first want to introduce myself. 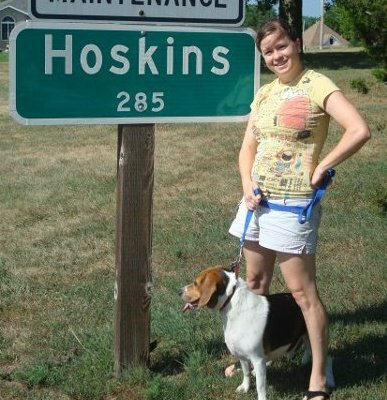 I hail from northeast Nebraska, where I grew up on a small farm outside of Norfolk…Hoskins, Nebraska, if you’ve heard of it. (My father still raises cattle and crops there today.) I was very active in 4-H, showing nearly everything from cattle to cookies. A natural fit when you have to do chores anyway. (For the record, my older sister did most of the work. Bonus of being a little sister!) Being from a small town, there isn’t much to do, so I took part in the usual team sports during high school. And I know every person from my graduating class. (There were only 30 of us.) After earning my degree in mass communications at Wayne State College, I made the move to the big city. Lincoln, Nebraska. For the past seven years, I worked at a prominent Nebraska TV station as a photographer, reporter and assignment manager. I focused on politics and crime, but still managed to make it back to the farm to harvest silage for the winter. I’m sure my dad thought I was too busy with my “big city life” to help, but I really enjoy driving those old tractors. (My job was to haul the silage from the field to the pit.) Now, I have the opportunity to use my communication skills to help represent and defend the livelihood of not only my family, but many families across the state. Hopefully, I can give another perspective to non-farming folk about the importance of agriculture, along the way. In this blog, I plan to share my thoughts and opinions as farmers daughter in a big city, talk about real issues that face farmers, ranchers and all Nebraskans and toss in a few of my favorite recipes from the farm. 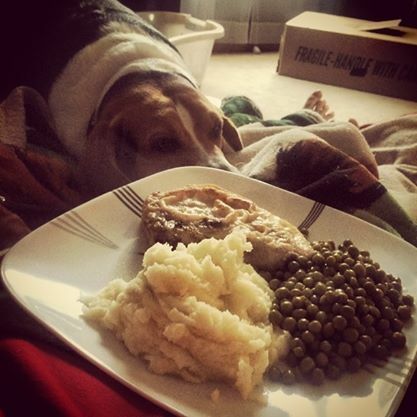 Like most country women, my mother is an excellent cook! She taught me the way around the kitchen. (It’s probably how I snagged my husband!) I will also bring in guest bloggers, including NEFB President Steve Nelson. I hope you enjoy the adventure!